Hey, remember how the final sequence of Six Feet Under was a unique, sublimely devastating summation of the show’s vision of its characters’ shared human experience? Pretty great stuff. Well, imagine an animated sitcom conservatively a decade-and-a-half past its prime grafting that ending onto its own middling, inconsequential season finale (its 29th, if you’re keeping score), Sia’s “Breathe Me” and all. I don’t know what I expected going into this last episode of the season, but I genuinely didn’t expect to come away pissed off. Congrats, Simpsons. Good one. The problem here isn’t just referencing something else. It’s how completely slapped-on and unearned it all is. “Flanders’ Ladder” is a piddling mess of an episode, peppered with a laugh or two, that never commits either to going for real emotional resonance, or comically undercutting it. So it just bobs along, occasionally landing on a funny idea but built on a disastrous foundation of mischaracterization and glibness. So when the ending comes, only the least discriminating would feel its montage of character deaths as anything but a cheap gambit to close out a truly disappointing episode (and season) with unmerited weight. 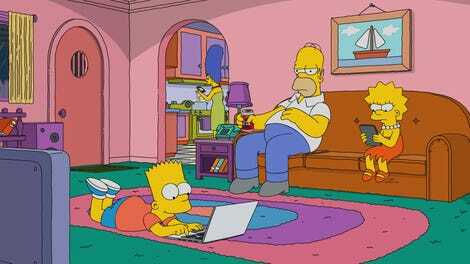 The plot sees Bart, struck by lightning thanks to an ill-advised attempted heist of Flanders’ internet router and some worse than usual Homer parenting, having comatose visions of Springfield’s dead. Since Lisa, uncharacteristically and irresponsibly spiteful after an Instagram prank from Bart, keeps whispering vengeful mischief into the unconscious Bart’s ear, Bart finds himself stuck in one of those fantasy scenarios where he has to help unquiet spirits complete their earthly business. Fair enough—if The Simpsons can spin an affecting story out of a hallucinatory, pepper-induced, Johnny Cash-voiced coyote, then getting shirty about a lightning and Sixth Sense plot is just inconsistent. But the script (credited to J. Stewart Burns) is as shallow as it is unfunny. For one thing, Lisa is way off model here. I like when Bart and Lisa are allowed to be kids, and their Bart-started-it hostility smacks nicely of authentic sibling pettiness. But that Lisa would screw with Bart while he lies near death in a hospital bed? C’mon, Burns. Beyond that sourness, the fact that Bart’s main spectral tormentor turns out to be Maude Flanders makes no bloody sense. Maude and Bart had no relationship, the fact that Homer was the inadvertent cause of Maude’s T-shirt cannon demise has never once been shown as affecting Bart in any way, and—worst of all—their interactions here aren’t funny. Much better are dream Bart’s interactions with Milhouse’s callously indiscreet therapist, voiced by Hank Azaria. “I can’t tell you what a relief it is not to be talking to Milhouse,” he confides to Bart, before revealing that he, too, is a ghost. (“If you’d been on time, you might have saved my life, but whatever,” the suicidal jerk tells Bart breezily.) Sure, it’s all Bart’s dream reality, but the episode also wants to apply some actual emotional stakes to Bart’s near-death adventures, so Bart’s indifferently imagined interactions there undermine whatever effect Burns was going for. And “Flanders’ Ladder” is going for emotional effect. The way dream Bart and the accidentally killed dream Homer (felled by a T-shirt cannon barrage at Maude’s command) are connected to real Bart’s possible death is clearly shooting for a dramatic payoff. And the remorseful Lisa’s anguished “I love you, and I want you back, Bart Simpson” might have landed, if their conflict and Lisa’s actions were better realized. As it is, the whole episode functions as a featherweight, no-stakes Treehouse Of Horror doodle, operating feebly inside an equally insignificant framing story. 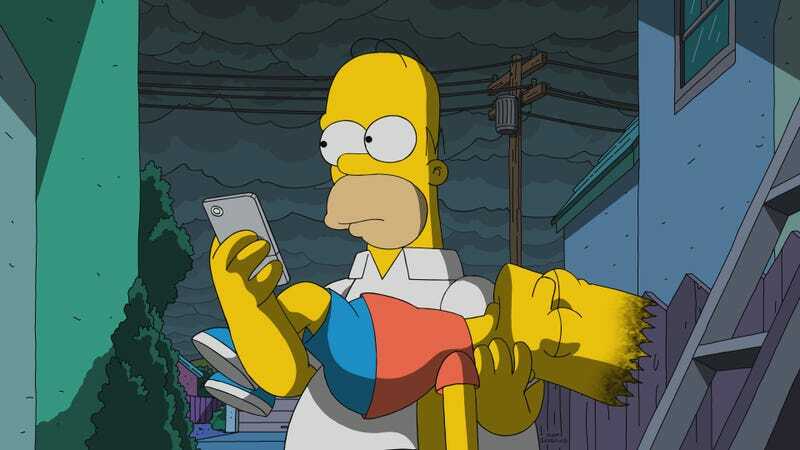 And so that tag, with Bart’s predictions of various characters’ deaths comically echoing their Six Feet Under counterparts, comes out of nowhere and accomplishes nothing. The elderly Lisa, stricken mid-meditation, spikes the camera to gasp out, “This has all been a waste of time.” The episode got that right, anyway. Other things destined to be forgotten: Marge and Flanders wind up married in Bart’s vision; Milhouse somehow remembers things only dream Milhouse could know. Oh, and Ralph becomes King Ralph. The episode ends with a farewell to one-time guest star Tom Wolfe, who died this week. And that’s a wrap on the A.V. Club’s reviews of season 29 of The Simpsons. I’m Dennis, I thank you all for reading, and for mostly behaving yourselves. See you in the fall for season 30! Episode grade: C-. Season grade: C.